Teachers and students have been asking me what is the best way to transfer video recorded on their smartphone to their computer? This is necessary if one were looking to edit the video using Windows Movie Maker. 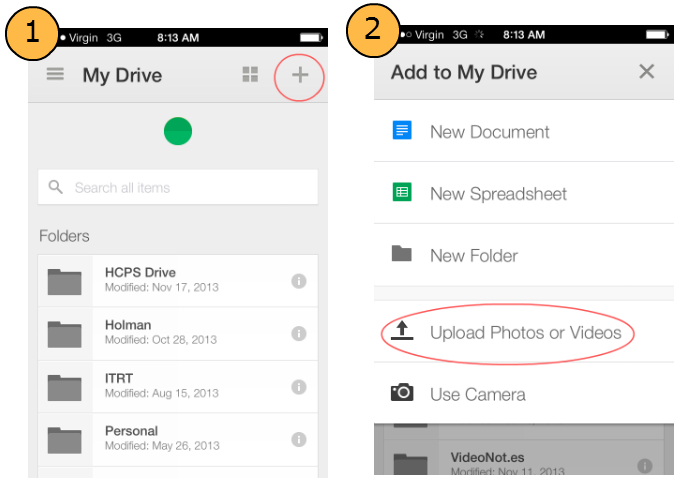 One way of transferring video to your computer would be to install the Google Drive App on your phone (Android or iPhone app available). This is a free app that connects directly to your Google Apps for Education (GAFE) account. Once the app is installed you will be asked to log into Drive using your GAFE credentials. After logging into the Drive app on your phone, click on the plus sign located in the upper right hand corner of the app. Next choose --> Upload Photos or Videos. After uploading the media you can download the file from Google Drive to your computer using your computer's web browser. If the file extension of the video is an .mp4 students will need to download and install the WMM codec from the Software center prior to importing the video file into Windows Movie Maker. Another alternative would be to covert the file to .wmv or .avi using the website https://cloudconvert.org/.